The United States Congress designated the Okefenokee Wilderness (map) in 1974 and it now has a total of 353,981 acres. All of this wilderness is located in Georgia and is managed by the Fish and Wildlife Service. Imagine waking to a mist enshrouded wetland, echoing with the calls of herons and ibis. Your camping site is a wooden platform surrounded by miles and miles of wet-prairie or moss-covered cypress. The only sounds you hear are the calls of native wildlife and those you make upon taking in such beauty. This is what it is like to experience a night in the Okefenokee National Wildlife Refuge (NWR) Wilderness Area! 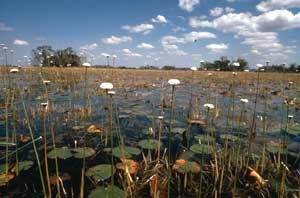 The Okefenokee NWR encompasses the Okefenokee Swamp, one of the oldest and best-preserved freshwater areas in America. This vast bog, lies inside a huge depression that was once on the ocean floor. The refuge extends just over the state line into Florida. The interior wetlands of the Okefenokee Swamp within Georgia have been designated the state's largest Wilderness. Native Americans called the swamp the "land of trembling earth" because the unstable peat deposits that cover much of the swamp floor tremble when stepped on. "Okefenokee" is a European interpretation of their words. The last Native Americans to seek sanctuary here, the Seminole, were driven out of the swamp and into Florida in 1850, and lived on to become the only Native Americans to refuse to sign a treaty with the U.S. government. The Okefenokee Swamp forms the headwaters for two very distinct rivers. The historic Suwannee River originates in the heart of the swamp and flows southwest toward the Gulf of Mexico. The second is the St. Marys River, which originates in the southeastern portion of the swamp, and flows to the Atlantic Ocean, forming part of the boundary between Georgia and Florida. The swamp provides a rich diversity of habitat types that support numerous species of wildlife and plants - islands, lakes, cypress forests, scrub-shrub areas, and open wet "prairies". Fire and water define the swamp's habitats. Lakes and prairies are created after long droughts when fire burns off layers of vegetation and peat. Rain water replenishes the swamp, filling in the open spaces created by fire. Later, cycles of drought lower water levels, causing vegetation and displaced peat blow-ups to cover the area again. Fire sweeps through the area once more and the entire process continues again. Planning to Visit the Okefenokee Wilderness? Plan Ahead and Prepare: Make sure your expectations and skill match your destination. You are required to stay on trails and at designated campsites within the Okefenokee Wilderness. There is very little current so be prepared to paddle the entire distance. Be prepared for weather extremes and emergencies. Every attempt will be made to rescue you in an emergency, but wilderness rescues take longer than other areas. Concentrate Your Impact: Stay on designated trails and campsites, leaving the remainder of the Okefenokee to the birds, alligators, bears, and other creatures. Traveling in small groups allows you more peace and solitude in the wilderness. Dispose of Waste Properly: Use port-a-lets and composting toilets. Carry some type of portable toilet in your boat. Use biodegradable soap when washing yourself or dishes. Dispose of wastewater in composting toilets. Leave What You Find: Do not harm or take trees, plants, artifacts, or animals. Do not leave anything behind to show you have passed through an area. Pack out ALL trash. Use Fire Responsibly: Camp stoves are required for overnight platforms. Campfires are allowed only at Cravens Hammock, Floyds Island, Canal Run, and Mixons Hammock. Use only downed and dead wood and make sure your fire is out and cold when you leave. We highly recommend not bringing your own firewood because it has the potential to introduce undesireable organisms into the area. If you do bring your own firewood, please burn it completely and take out any unused wood. Respect Wildlife: Do not approach too closely or harass or feed animals. Do not toss out food scraps or crumbs. This attracts unwanted guests at campsites and may lead to their removal if they become too aggressive. Be Considerate of Other Visitors: Although you will encounter few people along your path, avoid loud voices and noises. Sound travels within the swamp. Be courteous to other paddlers.